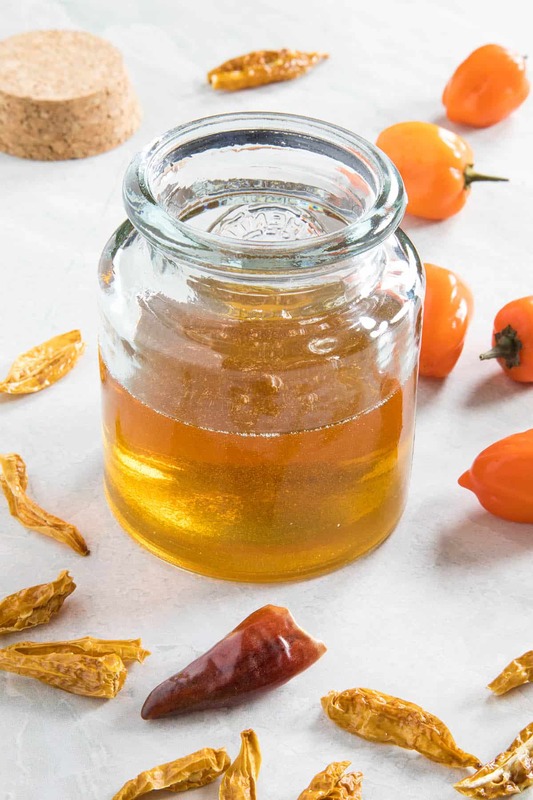 This hot honey recipe infuses honey with a mixture of fresh habanero peppers and spicy dried red peppers for a spicy honey you’ll love. Works with any chili pepper. If you like a bit of “sweet” with your heat, hot honey is going to be a new wonderful surprise. Many people like their sweets, but when you’re a chilihead like me, even those need a little blast of warmth to fully satisfy. When you douse hot sauce on pretty much anything, there’s nothing like a bit of heat infusion to kick things up a notch. That’s exactly what this recipe is – an infusion. 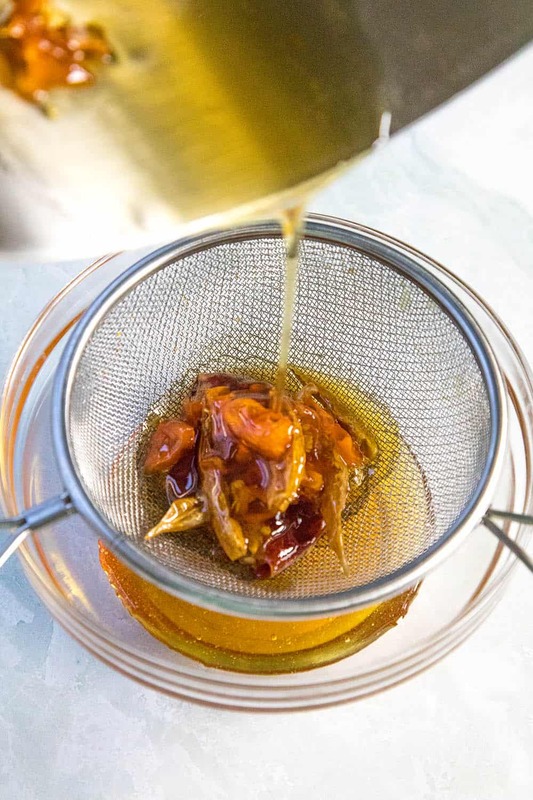 Like many other liquids, honey can be infused with all sorts of different ingredients and flavors. It lends itself to many different things, though, being me, I am partial to chili peppers. Of course. You’ve probably heard of brands like Mike’s Hot Honey. It’s great to buy some, but it’s also fun to make it on your own. Chop and add your peppers and honey to a small pot or a small saucepan. Heat the honey and simmer on medium heat for 5 minutes to infuse it with the pepper flavor and heat. I used fresh habanero peppers and spicy red dried chiles (Hawaiian Hots), though you can use any peppers you’d like. More on that below. Remove the honey from the heat and let it cool to room temperature. Strain the honey through a fine mesh sieve. You can toss out the peppers, or enjoy the fresh peppers, as they are now candied with honey. 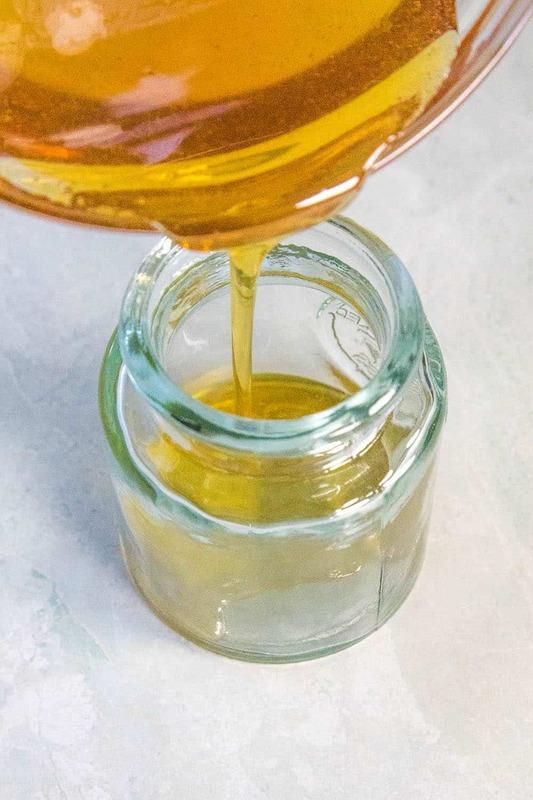 Store your infused honey in an airtight glass container in the refrigerator. Use as needed. It’s wonderfully sweet and spicy. BOOM! It’s very easy to make. I love easy. Go and make yourself some spicy honey! I know you want to. I used both fresh habanero peppers and spicy dried red peppers for my infusion, Hawaiian Hots in particular. I like them for their heat and flavor. However, you can use any type of chili pepper you’d like to make spicy honey. Try making it with milder peppers, like jalapenos or mid levels like cayennes or serranos for less heat. 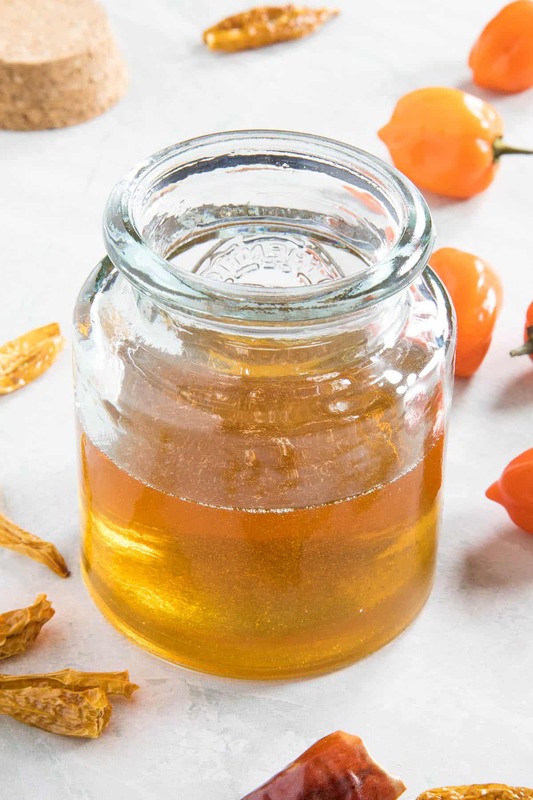 If you’d like some REALLY SPICY hot honey, make this with either fresh or dried ghost peppers, 7 Pot peppers, scorpion peppers, or even the Carolina Reaper. Oh baby! Talk about some heat. 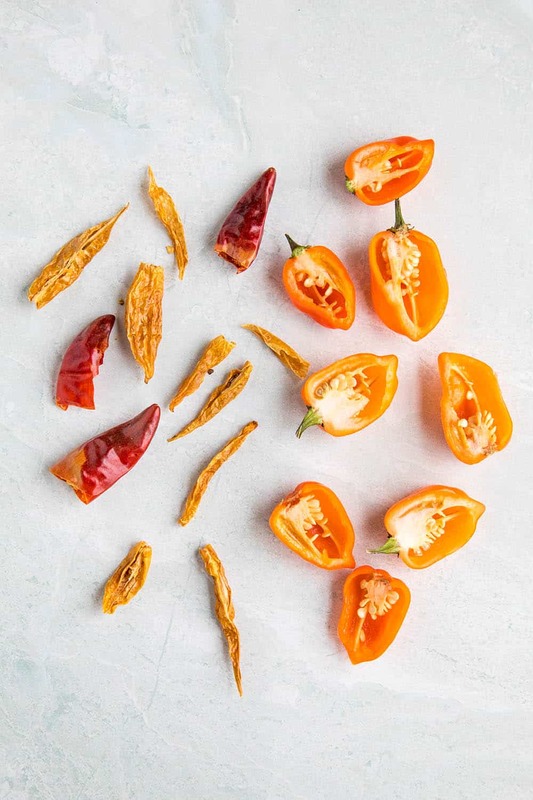 Habaneros will give you a good level of heat, though. Be warned. You can also make this with either dried OR fresh peppers. It works either way. I used a combination of them. Final note on the amounts of peppers used here. You don’t have to use as many peppers as I used. Other recipes will call for only a couple peppers for double the amount of honey that I used. 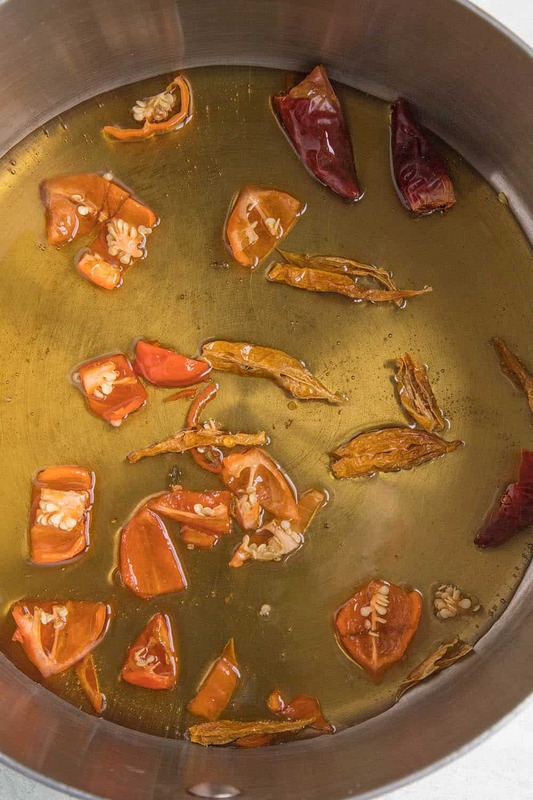 You can easily use fewer peppers for a milder infusion. For me? I love the heat and flavor. I go with more peppers. Shocking, I know. What Foods Go with Hot Honey? Fried chicken. This is a favorite for many people. Drizzle a bit of your spicy honey over freshly fried chicken and you’ll fall in love with it. Chicken and Waffles. Spoon it over chicken and waffles for some added kick, or over fried or baked chicken wings for a pop of sweet heat. Seafood. This is my personal favorite. Think of recipes like Hot Honey Salmon or Hot Honey Glazed Shrimp. Oh baby. Drizzle it onto seared scallops. Vegetables. Grilled, pan seared, roasted, steamed, it doesn’t matter. Biscuits. Match made in heaven right here. Ice Cream. Drizzle a little over the top of a scoop of vanilla. Wonderful. Cocktails. Use it anywhere you’d use regular honey. Consider pairing it with whiskey or making a hot toddy. So many ways you can go with this. Honey Mustard. Swirl a bit of your hot honey with a spicy mustard and you have a homemade spicy honey-mustard. Protein Shakes. Squirt in a teaspoon so it doesn’t taste like cardboard. They often lack flavor. Hot Water with Lemon and Honey. There are health benefits to this concoction. Why not add the benefit of extra zing? Think of it as an easy finishing sauce, but also a simple glaze. Or as your very own honey hot sauce. That’s it, my friends! I hope you enjoy your new hot and spicy honey. Go ahead and whip up a batch and fill some bottles. They make great gifts, too. 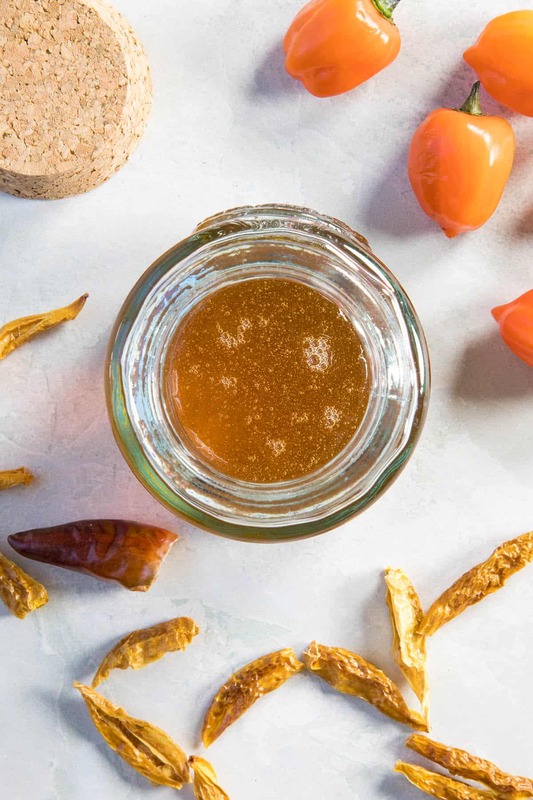 This hot honey recipe infuses honey with a mixture of fresh habanero peppers and spicy dried red peppers for a spicy honey you'll love. Works with any chili pepper. Add the peppers and honey to a small pot. Heat and simmer on medium heat for 5 minutes to infuse them with the pepper flavor and heat. Strain the honey through a fine mesh sieve. Toss out the peppers. Store in an airtight glass container in the refrigerator. Use as needed. Seed the peppers if you’d like, though I usually leave them in. They’re strained out anyway. Hot honey will last 4 weeks refrigerated. Use it as needed. I never imagined honey mixing with spice could be a thing that could be delicious especially while adding habaneros. Of course now that I think about it, I did have honey fried chicken in Korea but I think a kick of spice from your recipe would have done wonders to improve the taste. Thanks, Nyasha. It’s definitely a great combo!